The pool is closed until spring 2019. 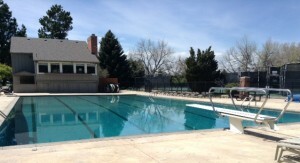 The pool is located directly behind the clubhouse at 8091 East Phillips Circle. It is a 25-meter, 6-lane pool. There is also a baby pool for toddlers. Willow Creek 3 residents needing a pool keycard should contact Amanda Phifer at Spectrum Commercial Real Estate Solutions. Phone 303 409-6018; email aphifer@scres.us. Willow Creek 3 has five tennis courts located behind the clubhouse at 8091 East Phillips Circle. Contact Amanda Phifer at Spectrum Commercial Real Estate Solutions, 303 409-6018, for your key to the courts. The key is issued to you while you remain a WC3 resident. Two of the five courts are generally available for individual use. The other three may be in use for league play. A court can be reserved up to a week in advance by registering on the clipboard in the white box at the gate. Your gate key is good only for the WC3 courts. Click here for details on reserving a WC3 tennis court. Tennis court number four is lined for pickleball play. Two pickleball courts are marked with black lines, one court on each side of the tennis net. The pickleball courts are available on a first-come, first-served basis. These were added as part of the 2017 resurfacing of the tennis courts. Contact Amanda Phifer at Spectrum Commercial Real Estate Solutions, 303 409-6018, for your key to the courts. The key is issued to you while you remain a WC3 resident. Two basketball hoops are available on court five of the Willow Creek 3 tennis courts. To obtain a key to the courts, contact Amanda Phifer at Spectrum Commercial Real Estate Solutions, 303 409-6018. The key is issued to you while you remain a WC3 resident.